Very old school pic, but gotta respect the gunsmithing past. If there’s one thing you need as a gunsmith, whether you’re just looking at getting started or are a twenty year old hand, is a library. There are so many different designs, gun types, gun models, that there’s always a little bit more that can be learned or another book that can offer insight, knowledge, or skills. I know several people who have 10+ books just before getting started, and one friend up in the Kenai area of Alaska with over 100 books in his gunsmithing library. Believe it or not, he complains about not having nearly all the information or resources he wants. In other words, a good gunsmithing book goes a long way. Fortunately, you don’t need a library of 100 books to get started, but you will want to make sure those early purchases are some of the best available. As you get more experienced working on various types of guns, or becoming an expert on the ones you like most, you’ll get a better idea of what you know, what you still need to know, and be able to expand your library accordingly. Whether you are just beginning to get into the art of gunsmithing as a hobby or are a serious practitioner, the more knowledge you get, the better you’ll become at figuring out what you’ll need in the future. But it all starts with a good foundation. So with that said and out of the way let’s dive right in! With literally hundreds upon hundreds of options out there, one of the most important things is to remember that these are the highly thought of base books. Use these as a starting point and grow your library based on your needs from there! Hatcher's Notebook Buy Now on Amazon! Professional Gunsmithing: A Textbook On The Repair & Alteration Of Firearms Buy Now on Amazon! The Soldier's Manual of Common Tasks Buy Now on Amazon! Advanced Gunsmithing: A Manual of Instruction in the Manufacture, Alteration, & Repair of Firearms Buy Now on Amazon! Gunsmithing: Rifles Buy Now on Amazon! 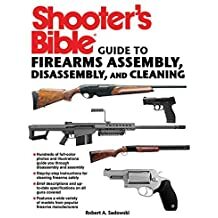 Shooter's Bible Guide to Firearms Assembly, Disassembly, and Cleaning Buy Now on Amazon! Considered by many to be the best of the best, the Holy Grail of all gunsmithing books so to speak, it has to be the top of any list. In fact, this famous gunsmithing book is so popular that it has had multiple printings, publications, and even a leather bound edition for collectors. While nice, this isn’t as practical for most of us as the sturdy paperback version that is right at home in the workshop and can be underlined, smudged, and show all the signs of good honest use. There is a reason this is the gold standard for all other gunsmithing books that have followed. 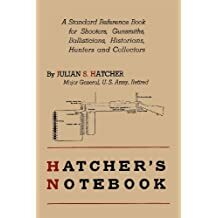 While some of the information might be outdated (it was originally written in 1948) the basics and foundations that Hatcher’s Notebook teaches still apply to most firearms to this day. When it comes to understanding the ins and outs of gunsmithing, how ballistics work, and the technical side of working with guns there is still no resource that comes close. This incredible in-depth guide covers an enormous amount of information that still is difficult to find in many modern manuals. In fact, many of the best modern manuals will still reference Hatcher’s Notebook for a wide variety of important topics like handling obstructions, heat treatment, recoil issues, technical gunpowder studies, corrosion prevention, and even more. In other words, anyone who is anyone not only knows about Hatcher’s but often owns multiple copies. Add in the extensive number of technical diagrams and it’s not hard to see why this is seen as an absolute necessity for anyone who is interesting in crafting guns, customizing guns, or working with firearms on their own. This book is full of experiments, findings, and really dives into the details in a way few other works do and it holds up to this day. All named after author Julian S. Hatcher who spent decades obsessed with munitions as an Army ordinance specialist for decades. If you don’t have this book then seriously, buy it now. If you don’t even know for sure if you want to dive into gunsmithing, buy this book. It will have the information you need to see if you dive in, get intimidated, or how you otherwise react. No matter where you’re at this is an incredibly useful resource you should get into your library today. 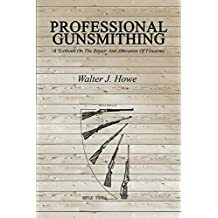 Written by the esteemed Walter J. Howe, Professional Gunsmithing is an outstanding book on this fine skill, and will be another one of those titles that you will often find on a list of the best gun books out there. This takes place for good reason. Focusing on taking apart and putting firearms back together, on repairing various parts of them, on altering and customizing the guns, there’s a reason this old tome is still considered a must have for any gun worker’s library. Howe focuses heavily on being a technical guide for any beginning student or low experienced novice looking to get into the art of gunsmithing and helping them master the basics even as they begin to understand intermediate and advanced skills and concepts. This is also an inspirational book that really wants to encourage, as well. This was one of the early resources that helped to show people they didn’t need a formal apprenticeship with a professional gunsmith in order to get into this skill. There are an enormous number of detailed diagrams in here, with over 100 drawings and illustrations to help visually break down everything and make it easier to learn. The original was published in 1946 and the best reprint we’ve seen recently is this one, which is a solid republishing of the original. This is over 528 pages in length and provides plenty of information that still remains relevant to this day. This isn’t the gunsmith book to give you information on a specific recent model but the foundation it helps you create is absolutely invaluable. Widely regarded as still one of the best gunsmithing books to this day and a great #2 to add to your beginning library. No one should be surprised that the Soldier’s Manual of Common Tasks makes it on this list. If you’re going to be serving in the military you need to learn about firearms, and as a soldier you need to know them inside and out. That means completely taking them apart, putting them back together, and making repairs and adjustments as needed. Since this is going to be a common task with soldiers, that means this book can be a great resource for providing basic information on firearms, their maintenance, making repairs, ad-libbing repairs in the field, and understanding how they work better. 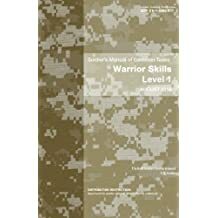 These are the specific skills that combine to make up gunsmithing, and while this manual isn’t in the same league as the top gunsmithing books of all time, it is a very valuable resource that also offers great additional (and actionable) training for survival, protection, defending yourself, and more. This is the 2015 version, and it is worth mentioning that the manual does change and that means that future versions might be better as a reference specifically when it comes to dealing with firearms or it might be worse. See old Boy Scout books versus new ones as examples of how a book that used to be a great resource has declined immensely in that regard. While this might not be the first book that pops into your head, there are plenty of diagrams of firearms used in the military, good descriptions of how to best maintain them especially in less than ideal conditions, as well as a wealth of information that makes this a good resource for a wilderness survival or prepper library. Great supplemental resource at the very least. This is the same manual used by the National Guard, Army Reserve, as well as the active Army. 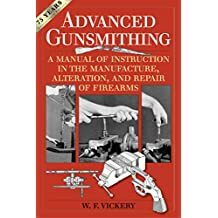 An old school gunsmithing book that was most recently re-printed in 2015, Advanced Gunsmithing by W. E. Vickery is classic in the world of both professional and amateur gunsmiths. This is one of those classic books that has long been seen as a classic among gunsmiths. Originally published in 1940, an era some consider among the golden age of gunsmithing because of the number of truly legedary books and manuals that were released, Vickery’s outstanding work is still among one of the most popular in the field to this day. This is a sizable tome at 448 pages which includes plenty of pictures and diagrams where needed to bring the full point home. Some of this is good for beginners, some intermediate, and there are some serious expert level concepts and skills in here. As many readers have commented, if you truly want to become a master gunsmith then you need to understand how it was done old school, understand the mechanics behind firearms, and even have at least a basic understanding of metalworking. This is a book that is heavy into the mechanics and in-depth repair of actually damaged firearms. This means large parts aren’t for beginners, but as with any great guide there is information here for craftsmen at every skill level. The detailed illustrations can help guide you through the more challenging parts of the book and there is no question that this has a place in any large gunsmithing library of note. This is an example of a more modern gunsmithing book that covers som of the more recent innovations in gun design, repair, and maintenance. This was written by Patrick Sweeney, who writes a lot of short but niche specific books on gun crafting. This is a good introductory book into rifles, covering all the common major types, and gives good practical information on improving the gun’s performance, modifying your rifle to fit custom needs, and how to handle repairs: both basic and more advanced. Sweeney has practiced the art of gunsmithing for several decades, so he knows his stuff inside and out. There are multiple step by step illustrated instructions throughout the book, and just as good as giving information about what you can do, there’s a lot of information on what not to do. Sometimes that information can be incredibly valuable in and of itself. Now this is a shorter gunsmith guide at a mere 160 pages, but what it covers it does cover well. The focus is on step by step practical advice or guide for getting the job done, and for clearly painting good beginner and intermediate jobs and which ones require an outright professional and shouldn’t be tried at home by beginners. This doesn’t go into super depth, but the basics it covers it does a good job of covering well. This is definitely a worthy beginning guide for rifle gun work and a good foundation for more specific guides to follow. The final one on this list is what you would call a good beginner’s guide to gunsmithing. This isn’t going to offer much to an experienced hand, and definitely not to a master of the craft, but it’s a solid beginning option that covers a lot of basics about hand guns, rifles, shotguns, and muzzle loading firearms, as well. There is plenty on taking them apart, putting them back together, cleaning & maintenance and more. Each section is fully illustrated and there are plenty of photos, as well. The instructions found in each section are set up to be step-by-step for easy following. Cleaning and maintenance is thoroughly covered in each section, and for true beginners this is a great way to get widely introduced to each type of firearm. This guide might get a little bit of criticism for being one inch deep and a mile wide, but the books higher on this list are about the deep dive, this is for beginners and for what it does, it does a very good job. It covers all the basic types of firearms so whether you fire a bolt action, lever action, single shot, pump action, pistol or revolver – whatever type of firearm you prefer there’s a section on it. This makes it a great starter’s resource to gunsmithing and can give a basic introduction into certain types or styles of firearms that are around. Very rudimentary, but everyone has to start somewhere and having a great guide like this can be the perfect bridge from beginner’s arena to diving deeper into the art of the gunsmith. As stated at the beginning, there’s no lack of option out there when it comes to great gunsmithing books, shooting books, or hunting books. I’m sure there are plenty of readers who can’t believe one of their favorites didn’t make the list, but this is a great foundation list to work off of. Keep in mind that with so many different types of guns (rifles, shotguns, revolvers, pistols), different styles & designs of each, a book that is perfect for one person might not be right for another. Look for very specific guides to the type or style of gun you prefer. There are plenty of gunsmithing manuals out there just on the 1911 handgun, Rugers, or certain types of rifles & shotguns. 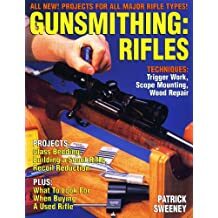 By using this list of the best gunsmithing books and then going gun-specific or model-specific you will be able to build the type of solid library that any gunsmith can be proud of. There are some really great gunsmithing resources out there. These books are just the tip of a much larger iceberg, but if you are going to start out a library or make sure you have all the classic pillars then this is a good starting point. If you know some others that need to be added to this list then please leave a comment and let us know what we should look at for a larger follow up list! Until then, be safe and keep up that gunsmithing education!